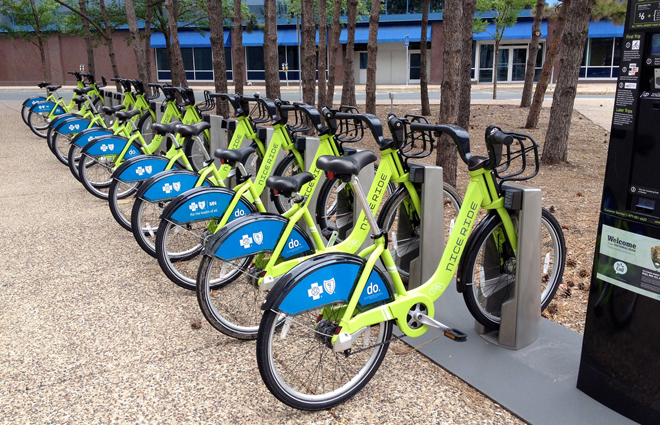 Bike share programs are spreading across the United States like carbon-reducing wildfire. Since the launch of the first modern U.S. bike-share system in 2008 (yes, the system has been around for decades, but 2008 was the first theft-proof and functioning system), 29 have popped up. In 2012 alone, eight new cities have set up bike share programs with more scheduled to begin in cities like New York, Los Angeles, and Fort Worth. Capital Bikeshare in Washington, D.C. is the model share program of the moment. Starting in 2010 with 1,100 bikes and 18,000 members, the program now has over 1,670 bikes and 175 pick-up and drop-off stations, making it the largest sharing consortium in the country. The major reason that bike shares actually work is the technology that keeps a share organization’s inventory in check. Free and coin-operated programs usually succumbed to theft, but new innovations in inexpensive bicycle tracking technology keep the fleet intact. The effects of going into a bike share are predictably beneficial, but here are some hard numbers. Capital Bikeshare’s 2011 member survey showed that over 41 percent of users reported that they cut down on time in their cars since joining, adding up to driving 523 miles less per year, or 487.7 pounds of carbon dioxide emissions. Capital’s members kept 1,632 tons of carbon dioxide out of the air in the organization’s first year. Most bike-share programs average a $75 annual fee, which, according to the same survey, translates to a driver saving about $819 a year instead of driving a car or traveling via taxi. If you want to get in on the communal action, here’s a list of the nation’s share programs. Expect more to pop up soon, too. Most programs, like those in Minneapolis and Washington, D.C., took between 12 and 18 months to get going. As for costs, Minneapolis specifically got their system to 700 bikes (Nice Ride Minnesota) for $3.2 million – compare that to the average $60 million cost required to build a mile of urban highway. And for bike retailers worried about losing sales in the face of bike shares, data shows that the programs actually promote bicycle sales.